If you’ve been looking to score some important patio furniture, this weekend’s Garden Sculptures and Antiques Fair at the New York Botanical Garden might be the place to do it. The fair, which the garden calls “the country’s original, largest and most important venue for authentic garden antiques,” will feature garden-related artworks and furnishings from 1750 to the present. 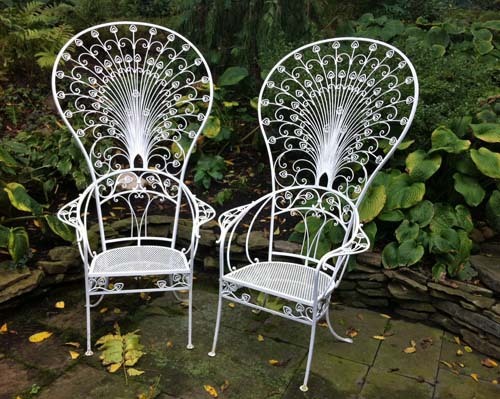 Salterini Peacock Patio Chairs are among the items for sale will be what the garden calls “an important pair of chairs,” the peacock-patterned Salterini chairs pictured left, that were once owned by the garden’s marquee patron Enid A. Haupt, for whom the garden’s Enid A. Enid HauptHaupt Conservatory is named. 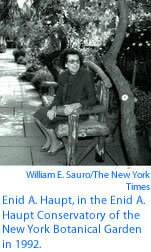 The chairs are now part of the collection of Salterini garden antiques offered by Joan Bogart. This year marks the first time in memory that garden antiques with a provenance related to Ms. Haupt, who died in 2005 at age 99, will be at the fair, the garden said. The fair runs from Friday through Sunday.